You walk into a restaurant. “Bar or dining room?”. You waver – is the dining room too formal? Is the bar too casual? You choose the bar. Once seated, you open your menu. Do you want the calamari or the guac? The charcuterie board or the three-cheese dip? Before you’ve read through the appetizers, your friend arrives. “How are you? How are the kids? How’s work?” You answer, as your stomach growls and the work day’s fog clouds your thought process. Here is the pivotal moment. Start the timer, crafter brewer, because you now have exactly 10 seconds to get the attention of the thirsty guest. Amongst the myriad choices, the dull ache of hunger, and the indiscriminating end-of-day thirst that really just craves something familiar, the consumer must think of and then choose your beer. This is why craft beer branding is essential. 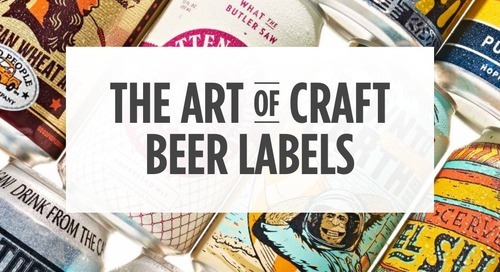 Tap handles, pint glasses, labels, bottles, trucker hats and t-shirts – your beer’s brand appears everywhere. It’s a lighthouse for the thirsty patron. Not to put the pressure on, but when it comes to branding, you need to get crafty. Here are two branding theories to consider using to make your craft beer, and your company, stand out in even the darkest, dankest, dustiest bars and stick to the minds of consumers when they’re deciding what to drink. Seth Godin’s Purple Cow theory is based on one solid branding principle: be remarkable. The old marketing and branding tenants still apply. More than advertising or distribution, in today’s increasingly competitive and innovative world, riskiness is rewarded. In essence, your brand must be worth remarking about. Godin suggests a few ways to “remarkablize” your brand. Remarkable products. He asserts that ordinary products and great marketing are no longer enough. There are hundreds, if not thousands, of craft brews. What makes yours different? How can brewers use this information to their benefit? It starts all the way back at product development. The key? Be unapologetically funky. Take microbrewery, HopEra, for example. What’s their purple cow? In addition to their standard wheat beer, IPA and bitter, they recently brewed and bottled a batch of crab beer. Before that, it was lobster beer. Next on the docket? Skateboard beer. They sell locally, but you can bet their tables are full, their beers are selling and you’ll never forget their offering. Think about it: “I had lobster beer last night.” It’s worth remarking about. Parallel 49 has also got the town talking. Their purple cow? Wild and curious combinations like their “Filthy Dirty” IPA, which has notes of orange, grapefruit and pine and was described as tasting like the most delicious balsamic vinegar. What’s more? They also have a selection of brews, which they call “rarities”. Only available “sometimes”, they feature beers like “Lil Redemption”, which is described as follows: “Aged in cabernet sauvignon barrels with wild yeast and sour bacteria for 2 years and then blended with sour cherries for 3 months. Big notes of cherries, vanilla and cinnamon.” They might have it. They might not. But you’ll have to go to find out. Similarly, New York’s Finback brewery offers alternative brew flavours and names that you’ll never forget like Water on Mars (a red IPA), I Feel the Universe, Coasted Toconut, and even some infused with Jalapeno. Conspicuous consumption is a theory by Thorstein Veblen dating back all the way to 1899. It asserts that consumers buy expensive items as a show of wealth and status rather than to cover true needs. Likewise, conspicuous conservatism is the idea that consumers buy environmentally friendly items to be viewed as altruistic. Now, we’re not suggesting that your products should be overpriced or green-washed, but the essence of these concepts is that brands inevitably become a representation of the consumer. There must be a way for the consumer to feel an affinity for the brand, to identify with it on some level. Someone who enjoys 33 Acres of Sunshine – a wheat beer with a minimalist and whimsical, simple label - will likely fit a different profile than someone who prefers Snake Venom – self promoted as the world’s strongest beer with 67.5% alcohol and an electric green label, complete with warning tag. So what does this speak to? Know your ideal audience beyond taste alone – look into their preferred aesthetics, their consumer habits. Design your brand materials around that. You’re not just creating a label after all – your brand should be constructed as a person with a story. Branding icon, Marty Neumeier says, “A brand is not what you say it is. It’s what they say it is.” To gauge what they’ll say, you must first know who “they” are. Develop a vignette of different customer types. A mid-twenties single female writer, living in the city with four roommates on a budget who’s concerned with eating healthy for less vs. a mid-fifties married male who likes steak and potatoes, but whose partner wants him to eat more greens. Learn about their most pressing issue. What do they value above all else? A funky flavor? Low calorie? Cost? Investigate their information source. Where do they get new information? In other words, where’s the best place for them to learn about you, and you to learn about their interests? When it comes to branding your brew, your beer, your brand and your audience should all be aligned. You can’t have one without the other. At the end of the day, experiment, just as you would with your flavors. Try things on, and if they’re not working, try something else. The most important thing you can do is get creative, get bold, and then ask for feedback. Good news for you: most people will do just about anything for a free tasting and case of beer.